In a small bowl, stir the yeast and the sugar into the warm water and allow it to stand until all bubbly. With the metal blade, put the flour, oil, eggs and salt into the work bowl and turn on the machine. Pour the yeast mixture through the feed tube and process until dough cleans the inside of the bowl. If the dough sticks, add more flour by the tablespoon through the feed tube. Allow each addition to be incorporated before adding any more. If, on the other hand, the dough is too crumbly (doubtful), add water by the teaspoon through the feed tube. Again, allow any addition to be fully incorporated before adding more. Once you have the desired consistency, process the dough until uniformly supple and elastic – only about 40 seconds. Easy huh? Transfer the dough to an oiled bowl and rotate to coat the entire surface with oil. Cover with plastic wrap and allow to sit quietly in a warm spot until doubled – about an hour. With your fist punch (only once) the dough to deflate; then dump onto a floured work surface. Divide into three equal portions. Roll each of the 3 pieces into a rope, about 16-18 inches long. Place 3 of the ropes lengthwise on the work surface in front of you, with an inch or so spacing between them. Lift the rope on the right and place it between the center rope and the rope on the left. Now take the left rope and place it between the center rope and the right rope. Continue in this manner (just these 2 movements) until you get to the end. (See photo above.) Pinch the ends together tightly. Tuck both pinched ends under and fluff it up to make it pretty. Transfer the braided loaf to a baking sheet, lightly oiled, or a baking sheet with silicone pad or lined with parchment paper. Cover with a clean cotton towel and allow to rise ’til doubled, about 1 hour. When the loaf has doubled in size, brush with the reserved glaze and sprinkl with either poppy or sesame seeds. Bake for 10 minutes at 400 (205 C). Then reduce oven temperature to 350 F (175 C) and bake until loaf is golden brown and sounds hollow when rapped on the bottom – about 20 minutes longer. Immediately remove from the pan and transfer to a wire rack to cool. Simply follow the instructions above, adding ½ teaspoon anise extract, increase sugar to ¼ cup, and consider changing out the oil for same amount of melted butter (cooled to just above room temperature before adding.) In the final stages of processing, add the zest of ½ orange – and pulse a few times to incorporate, but not enough to break into microscopic little bits. Place a dyed egg in the center (or add 2) tucked between the ropes AFTER the loaves have risen, but before they’ve been washed with the egg. 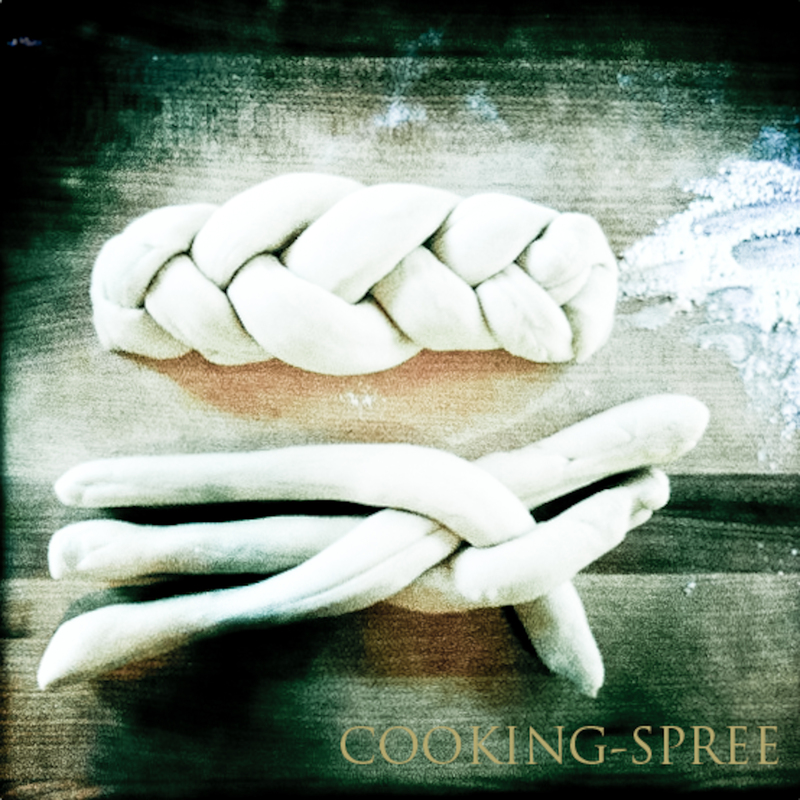 See the Easter Sweet Bread (Tsoureki) for a classic version, here. Love the idea of your Greek easter bread with anise and orange. It reminds of a dish my aunt used to make for us when I was little. Great work and description. Would be good for any occasion. I love this bread and the fact that we can punch and loiter too 😉 Gorgeous photos! Nick, I’ve got the braid started for you. It’s SO easy! I know you can do it! Oh I love your new ‘lomo’ style it really works with bread, beautiful! I need to make mine in the dead of winter. It’s already so hot here that mine rises as I’m braiding. Love the photos. Absolutely gorgeous photos. You surprised me, and I loved it! One of my very favorite foods of all time. I can imagine it now. Tastes like home. Thanks Spree! That sounds very easy 🙂 I will give it a try. I love Challah bread. Yum!